photo frames are great for creating cozy atmosphere at home. Usually special frames cost from 100 to 300 dollars. However, the quality is often poor and their interfaces are too clunky and uncomfortable in the majority of situations. I have an idea of how to create a great photo frame that will make you happy with high-quality picture. See your beloved people in the highest resolution. Use your old iPad in the frame mode for special occasions or for everyday life. I'll show you how to do it on the example of my 2016 9.7" iPad Pro. It runs the latest iOS version, but it is not a big problem, as there is an effective way for achieving our goal. Follow the steps from my today's manual and you'll learn how to update your digital photo frame from other devices such as iPhones and Macs too. There is also a way of preventing other people turning on the photo frame mode. No one will enter it without your permission. First, you should turn on the iCloud Photo sharing feature. Visit 'Settings', go to 'Photos' and tap on 'iCloud Photo sharing'. It is absolutely free and let's you to create new albums that synchronize with your iCloud. So, you can share your pics not only between your own devices, but also with other iCloud users. After you turned the feature on, create a shared album. Tap 'Photos', and choose '+' in the 'Shared' section. Name your album in some way like 'Photo frame' or 'iPad photo frame'. If you need, you can invite other users to add their images to the slideshow. Choose 'Create'. We're done here. Your new album is ready for being filled with photos. Now let's add some pictures to this album. 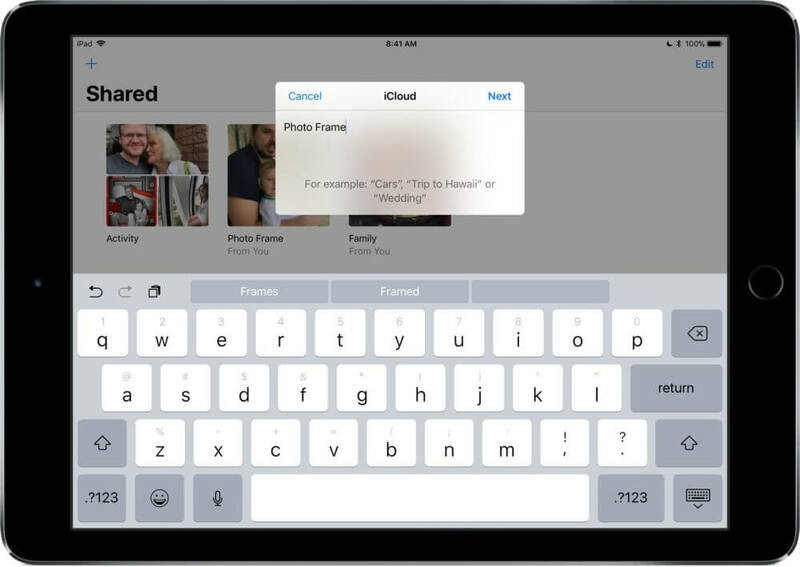 Find the button with a plus on it it 'Photos', 'Shared' and the folder named 'Photo frame' or 'iPad photo frame' or however you named it. You can do it via your iPhone, iPad, MacBook or Mac. Just make sure that you are using the same account in iCloud. The device should also have the iCloud Photo sharing feature enabled. As I've said before, you can enable it in the Photos application. 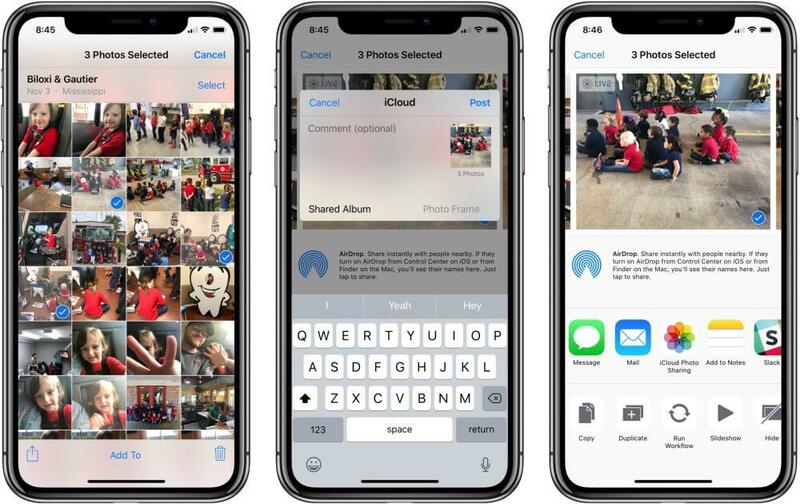 If you need to upload several pictures at the same time, go to 'Photos', find 'Select' in the upper right corner, choose all the photos you need to upload, tap the 'Share' button that is situated in the lower right corner. 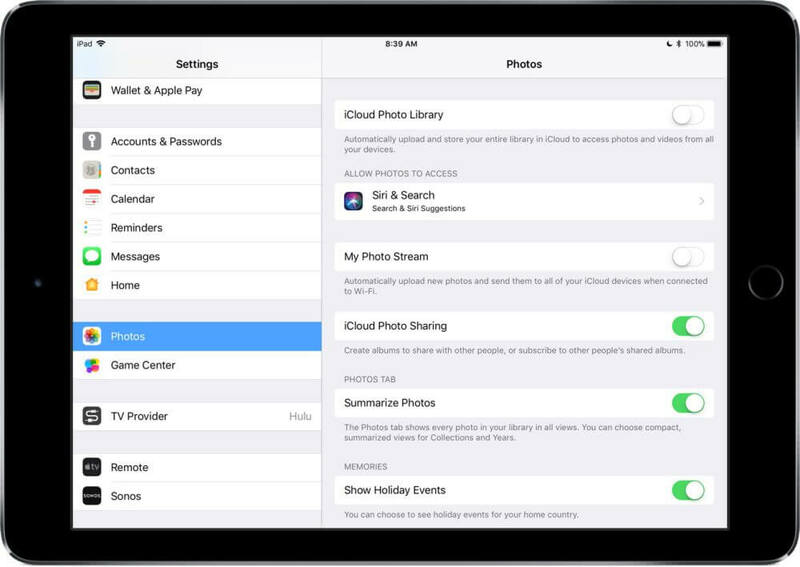 Then choose 'iCloud Photo sharing', 'Photo frame', and post them. For enabling the single app mode, use 'Guided access'. Visit 'Settings', go to 'General', choose 'Accessibility'. There you will find the 'Guided access' option. It will let you lock the iPad to one app by clicking the 'Home' button for 2 times. Here you can set a password. There is also an opportunity for enabling Touch ID for ending this mode. As for me, I prefer to disable all the hardware buttons and not use time limits when turning on the photo frame mode. 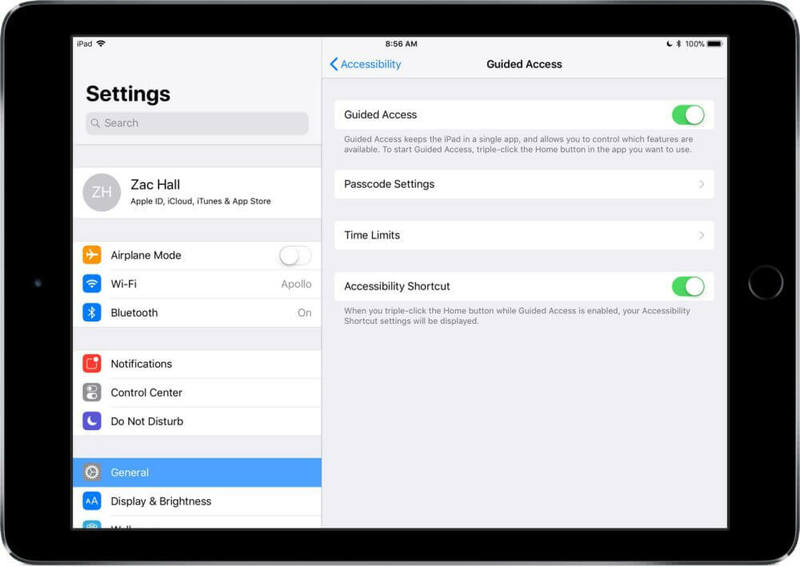 These steps will prevent others from turning the iPad off or closing the current app. If you need to prevent the automatic turning off the display, disable the Auto-Lock feature. Head to 'Settings', find 'Display & Brightness', choose 'Auto-Lock' and tap 'Never'. The good news that you can turn off your iPad's display manually when you need it. Use the sleep-wake button. Note that Guided access has to be inactive for turning off the screen. Other way, it won't react to any manipulations with the button. What's more, you may turn on/off volume, enter the Silent mode or Dnd mode in the Control center. This will help you to avoid interruptions. 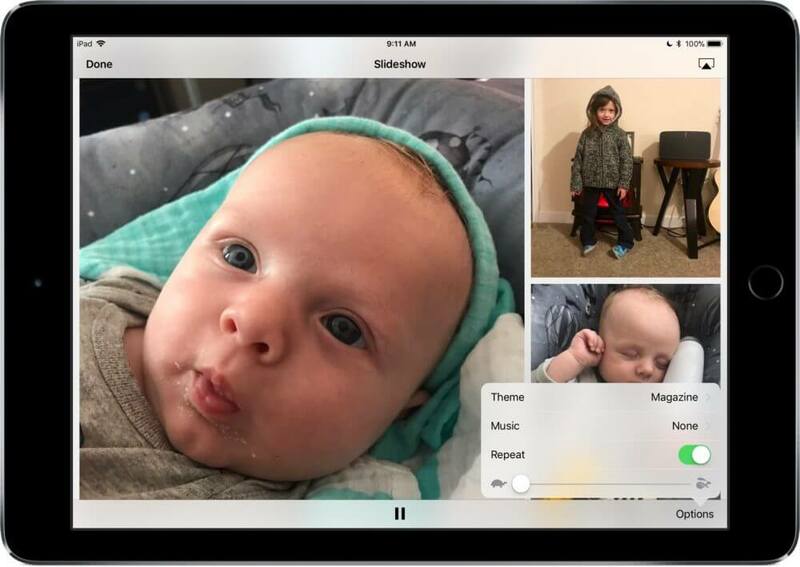 So, you may videos to your 'iPad Photo frame' album. The volume control will be a useful feature in case you do this. Remember that Siri volume can be set separately, so it won't interfere the process. Go to 'Photos', proceed to 'Shared' and choose your album. Tap the 'Slideshow' button in the upper right corner. If you want, set another theme, music, or translation speed with the 'Options' button in the lower right corner. Turn on 'Repeat' in case you want to start your slideshow again after it runs to the end. Tap the 'Play' triangle button in the center and click 'Home' for 3 times to enter the single app mode. Now make sure that your iPad is connected to a source of power. This will prevent it from battery draining and turning off. Use 12-watt (or higher) adapter & the Lightning cable. As for me, I usually use one from my iPad Pro with a Smart connector. But I do this only cause I own them already. If you don't, it may be a little pricey. Why to pay more when there are alternatives? As a conclusion, I have to state that creating a photo frame from an old iPad is a great deal. You will bring it to life again and give it a new purpose. You can also use your main device for showing slideshows during family parties or other occasions. Digital photo frames are great decorations for living rooms or guest rooms. The whole process of manual setting your iPad as a Wi-Fi digital photo frame may take some time, but one you have done it, you won't need to do anything in future. Maintaining your slideshows is easy. 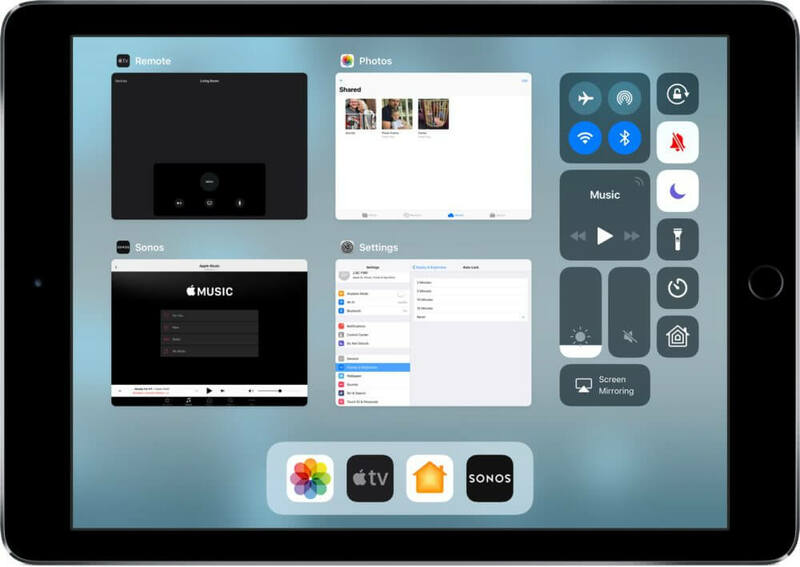 Surely, I'd like Apple to return a built-in slideshow feature to new iPads to make everything more comfortable. Still, there are effective solutions and I'm happy with them, though, it takes time & efforts. I hope this article was useful and helped you to create a cozy environment at your home with the help of an iPad. Subscribe to my blog to learn more!